This shot of Bernard Sumner from Bad Lieutenant featuring former members of New Order was taken tonight at the Electric Ballroom in Camden. 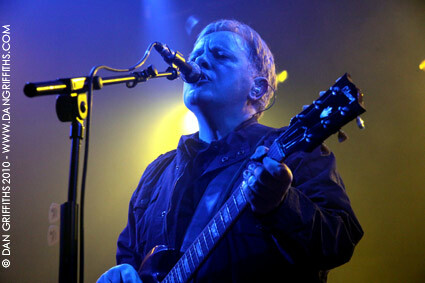 Formed in 2007 the band consist of Bernard Sumner, Phil Cunningham, Jake Evans and Stephen Morris with Blur bassist Alex James guesting on a number of album tracks although he did not perform with the band this time. The band released their debut album ‘Never Cry Another Tear’ last year. I was only at the show of four songs as I had to rush off and submit my pictures but the band did play my favourite New Order song ‘Regret’ three songs in. You can see more images in the gallery.